Online sports publication, Bleacher Report, has released their take on the Top 25 rising seniors in college basketball. The list contained all the usual suspects, Kris Jenkins from Villanova, Nigel Hayes from Wisconsin and others from the BCS schools. The Atlantic 10 has three guys making the Top 25 rising seniors. Charles Cooke from Dayton made the list coming in at #20. Davidson’s Jack Gibbs reached the highest spot for any A10 player at #6. JeQuan Lewis celebrates after earning his first NCAA tournament win. 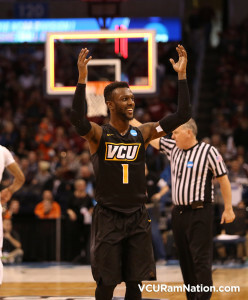 The #23 spot would belong to VCU’s JeQuan Lewis. Lewis averaged 11.3 points per game and 5.1 assists per game but we should see Lewis step on on all fronts with VCU losing graduating senior Melvin Johnson. Bleacher Report’s Kerry Miller compiled the list and had the below quote about Lewis’ play towards the end of the season. Read the entire story on Lewis here. The full-season stats aren’t much to write home about, but JeQuan Lewis was just starting to heat up when the year ended. In his final three contests against Saint Joseph’s, Oregon State and Oklahoma, Lewis averaged 20.7 points and 8.0 assists.